IMPORTANT NOTE: All statements by students are original and unedited. None of the statements have been edited, added to or altered in any way. Thomas Huser, Ph.D., James Chan, Ph.D. & Doug Taylor, M.D. Raman Spectroscopy is an analytical technique that utilizes a single, finely tuned, low-powered laser, which enables the molecules in a sample to be chemically characterized non-destructively and without using dyes. This technique, based on the inelastic scattering of photons, produces spectra reflecting the vibrational energy of the molecular bonds in a sample. Laser trapping involves a momentum transfer from a light beam to a single particle that is suspended within the laser focus resulting in a balance of optically induced forces. Laser trapping is beneficial because it maximizes the strength of the Raman signal and will ultimately also allow for cell-sorting through its cell-manipulation capabilities. Different DNA and protein concentrations within the nuclei of single cells produce characteristic Raman peaks, thus allowing differentiation between cell types. Normal T and B cells were isolated from fresh, whole-blood samples and their spectra were compared to those of the cultured Jurkat and Raji cell lines as well as leukemic T and B cells using Principal Component Analysis to show that normal and transformed cells produce distinct spectra. The goal of this project was to add substantially more data to previously obtained preliminary data in order to confirm initial findings of this technique’s potential and improve the overall statistics. In addition, Laser Trap Raman Spectroscopy was used to characterize and find Raman signatures of Monocytes and Neutrophils as part of a goal to characterize all hematopoetic cell types. My summer internship with CBST was a wonderful experience. The part of my lab experience that left the biggest impression on me was my ability, as an undergraduate student, for direct collaboration with my advisors. Everyone I worked with was incredibly helpful, easily accessible, and genuinely excited to get me as involved as possible, constantly offering me new opportunities to gain experience. From what I’ve heard, this is not a common undergraduate research experience. At weekly group meetings interns were given the opportunity to practice presenting their research; the public speaking/presenting skills I worked on while a part of CBST will prove invaluable to me throughout my career as a scientist. The Tahoe retreat provided a great opportunity for me to get a glimpse into many areas of research within the Biophotonics field and it left me with a positive first impression of scientific conferences. A wide variety of presenters, from many levels of academia, enabled me to see how broad and deep the emerging field of Biophotonics is, a good contrast with my own narrowly focused research. The weekly seminar-series was a great supplement to my work in the lab. From diversity issues to writing and networking skills, the workshops focused on key topics that will enrich my involvement and help me excel in the professional world. My summer experience with the Center for Biophotonics matured me as a scientist, as a professional, and as a person; it was truly an invaluable experience. Thomas Huser, Ph.D. & Doug Taylor, M.D. The research conducted was aimed at attempting to find a non invasive method to compare the compositions of normal T and B cells to those of Leukemia patients. Raman spectroscopy was used in order to analyze the data and determine the probability of using it for an earlier diagnostic technique for cancer detection. If Raman was able to detect the differences in between T and B cells that were cancerous and those that were not, then it would be able to be used as a diagnostic technique. In order to obtain the samples, human blood was taken and then put through a series of protocols to separate the buffy layer from the rest of the blood. The whole blood was mixed with RMPI media, which was also used to culture the cells, as needed. After adding a Ficoll gradient to the blood, centrifugation was used to separate the buffy coat from the whole blood sample, which contains both the T and the B cells. In order to separate these lymphocytes from the buffy coat, activated Sheep Red Blood Cells (SRBC) were added to the solution and incubated. SRBCs bind to the T cells, activating them and creating a heavier layer to distinguish between the two types of lymphocytes. Once the T and the B cells are separated, ACK is added to each solution to lyse the SRBCs still attached to the cells through osmosis. Spectra was taken of the isolated lymphocytes, both the T and the B cells and compared with spectra from Raman and Jurkat cell lines. The normal T and B cell data showed consistent peaks and the research is being continued to obtain more data. This summer was an amazing experience because of the people I was worked with and the resources that were available to me. All of my mentors were present to help me and had so much patience with me while teaching us about biophotonics. I was able to learn a great deal about working in a research because I felt as though my research mattered and was able to attend group meetings and other events. Working with Raman Spectroscopy was exciting because it is a new technology and there are many opportunities for innovation and new ideas. The interactions that I had with other labs affiliated with UC Davis were interesting because I was able to learn new protocol and determine which ones would work the best for our experiments. I felt as the people at the Center for Biophotonics, Science and Technology were very open to working with other fields, explaining their work to them, as well as any difficult concept associated with their research. The conference in Tahoe was incredible because I got to hear so many people speak about the new research being conducted. Hearing about all of the opportunities in Biophotonics sparked my interest to continue researching. I would highly recommend the CBST program! Kit S. Lam M.D., Ph.D.
GFP-expressing cancer cells can be used to study various cancer therapeutic applications, both in vivo and in vitro. Examples of non-invasive in vivo applications include monitoring tumor growth, metastasis, and progression by whole-body optical imaging. GFP-expressing cells can also be used to monitor cell trafficking or movement of cancer cells, and evaluate drug efficacy in small animals. In vitro, they can be used to identify novel targeting ligands by high-throughput screening. The aim of this study is to generate stable GFP-expressing lymphoma and pancreatic cancer cells for use in therapeutic applications. Several lymphoma cell lines (MOLT-4, Raji, Ramos, Jurkat) and pancreatic cancer cell lines (XPA1, XPA3, Mia CaPa2) were transfected with GFP plasmid DNA. Transfection was performed using the Lipofectamine 2000R reagent, and stable GFP-expressing clones were selected by growing them in medium containing Geneticin. The cells that continued expressing GFP for several passages in wells were further selected and grown in increasing volumes. Out of 7 cell lines, 2 (Jurkat and XPA1) were successfully selected, and the other cell lines are in the process of selection. The GFP-expressing cells were then used as probes to screen one-bead-one-compound (OBOC) combinatorial libraries for cell surface ligands. In turn, these ligands can be used to identify potential drug targets on the cell. GFP-expressing Jurkat and XPA1cells were mixed with non-fluorescent normal pancreatic cells (HPNE) and screened against OBOC combinatorial library beads. By this method, we identified some compounds that bound selectively to GFP-expressing cancer cells, and not to normal cells. I was fortunate enough to receive the opportunity to return to CBST for the second year in a row as a summer intern. As a returning intern, I have seen this wonderful multi-disciplinary program grow right before my eyes. There are more labs this year, even more institutions involved, and the brand new Oak Park Research building in Sacramento, where I worked in Dr. Kit S. Lam’s lab under the supervision of Dr. Kumar. I cannot begin to describe how valuable this experience was for me. Since I already had some previous research experience, I was assigned two projects that challenged my skills and pushed me to acquire even more laboratory skills such as tissue culture and transfection. Although much was expected of me, I had two amazing mentors in the lab. Dr. Kumar and Dr. Lam were incredibly helpful, and with their friendly guidance and expertise, I had a productive summer at CBST. My positive experience in the lab has inspired me to pursue a PhD, and continue working on oncology research. Outside of the lab, we had numerous group activities and seminars, led by Ana. We learned about networking, interviewing, and applying for jobs. All the seminars were very informative and will no doubt help in the future. We also did many fun group activities such as go to Muir Woods, or bowling, where we got a chance to bond and relax with other interns. We also got a chance to bond and have fun during the Annual Retreat, which takes place in beautiful Squaw Valley. At the retreat, I enjoyed the breathtaking views, got to meet many researchers and other people from CBST, and indulged in the awesome buffet. I wouldn’t have traded my summer experience at CBST for anything. It has definitely made me grow as a person, and given me the tools to succeed in my career. Internal kinesins are the rogue members of the kinesin family. Whereas antereograde kinesins are molecular motors which walk to the plus end of microtubules, and retrograde kinesins are molecular motors which walk to the minus end, internal kinesins do neither. Rather, they depolymerize. The crux of our research at UCSF is to understand the mechanism of internal kinesin depolymerization. We have mutated several internal kinesins and have given them molecular motors. We plan to observe whether or not these mutated kinesins walk or depolymerize by using spectroscopic technologies available at CBST. At UC Davis, we will use both, the Picoquant Microtime 200 system (a beam-scanning confocal fluorescence microscope) and a spinning disc confocal fluorescence microscope to observe mutated internal kinesin movement. We are interested in studying whether these mutated kinesins walk or depolymerize in order to acquire more information on their mechanism. We shall compare results obtained from UCSF's electronic microscopes with UC Davis' optical microscopies. CBST provides a phenomenal experience for student scientists chemistry or biochemistry hoping to gain some hands on physics experience. The technology at Oak Park is high-end and state of the art. The scientists are knowledgeable. CBST administrative staff is friendly. Davis is also a wonderful community and environment for cyclists. There are several incredible bike trails. Moreover, if you are interested in cycling from Davis to the Sacramento Lab, it is more than doable. Davis also has a farmers' market on Wednesdays and Saturdays, which offers a home-town appeal. I am glad I spent my summer here! Everyday our cells encounter oxidative stress or environmental insults that can lead to DNA damage. If this damage is not repaired, carcinogenesis may result. My studies focused on the types of DNA damage caused by the environmental carcinogen benzo[a]pyrene (BP). In the cell, BP is metabolized to four diol epoxide stereoisomers, (BPDE). One of these isomers is carcinogenic, while the other three are not. BPDE binds covalently to DNA to produce DNA adducts. The nucleotide excision repair (NER) pathway deals with BP-DNA adducts. The questions that we are trying to address are: (1) what are the search mechanisms that proteins in the NER pathway use to discover damage, (2) what are the processes used to assemble these proteins at the site of damage, and (3) how does the stereochemistry of the BP adduct affect these interactions. The methods being used to answer these questions are total internal reflection fluorescence (TIRF) and (OI-RD) oblique-incidence reflectivity difference scanning microscopy. My work involved identifying each DNA sequence that resulted from the reaction to incorporate a short oligomer BP-DNA adduct into a longer DNA sequence. Snake venom phosphodiestarese was used to digest the DNA into their individual nucleotides. HPLC (high performance liquid chromtography) was used to separate the different nucleotides. By examining the ratios of the different nucleotides for each sequence, we can determine the corresponding sequence. Circular Dichroism (CD) was then used to determine the stereoisomer of the BP-nucleotide adduct. I also worked on expressing one of the proteins in the NER pathway. This is the first time I worked in the labs outside of college related environment. I gained hands on experiences with using techniques such as using the HPLC (High Performance Liquid Chromatography) machine and Circular Dichroism machine, which assisted in our research project. During this internship I went on a retreat to practice my networking skills and gain insights to different research projects. IN terms of networking, I met James Boggan, co-director of CBST. James gave me insight as to how I should approach my plan of obtaining a M.D/Ph.D. I also listened in on talks about research projects dealing with topics such as Quantum dots or Bioluminescence assays. This retreat showed me that science has an unlimited array of applicability. The time I spent at Lawrence Livermore National Laboratory has given me some perspective on the life of a researcher. Working with Monique Cosman, my supervisor, I understand a researcher performs 99% grunt work but looks forward to the 1% of success or discovering something interesting. The most interesting part of intern experience would be meeting my new roommates in Pleasanton and other interns. It is exciting to have a roommate from Germany who told me about some of European culture. The interns I worked with at the labs, Christine and Natalie, helped me endure the teleconference workshops and helped with completing the runs on the HPLC machine. I hope I will have the chance to continue my internship under CBST. The purpose of this research is to develop a method that makes use of Quantum Dots (QD’s) to detect inflammatory activity in atherosclerotic plaque. Plaque inflammation leads to the development of "soft" or vulnerable plaque. Such plaques are prone to rupture and release their contents into the bloodstream, causing a blood clot to form. Heart attacks and other acute coronary events usually result from the rupture of high-risk, vulnerable plaques in coronary arteries. Scavenger Receptor (SR) Proteins are plasma proteins that uptake modified Low Density Lipoproteins (mLDL) and gather at the site of inflammation. The mLDL, in turn, take up cholesterol, which encourages cholesterol buildup at the site of inflammation. We hypothesize that QD’s can be utilized in the detection of inflammation by applying the available technology to conjugate SR Protein antibodies to QD’s. Although no experiments have been conducted, we worked on gathering data for experimental protocols that will allow targeting of SR in in-vitro arterial models. The experience that I have had as a CBST intern this summer has been one that I cannot place a value on. I have not only gained practical lab experience, but I have learned more than I could have imagined from those around me – both peers and adults. Likewise, I did not only gain experience from being in the lab, but also life experience from living on my own and learning how to adapt to environments and people that I was not familiar with. The CBST internship offered me so many opportunities and resources to take advantage of. I know that I will be able to utilize the knowledge I gained here from those resources and the people around me to help me continue to grow as both a student and a person. Current photochemical techniques for patterning (bio) molecular thin-films (e.g., OTS and lipid bilayers) using a low pressure mercury UV lamp have been unsuccessful in establishing defined boundaries at pattern edges. For instance, the monolayer-bilayer interfaces, formed by fusion of lipid vesicles onto photopatterned OTS surfaces, reveal a buffer zone where neither of the two lipid formations will occur. This occurs due to light diffraction at the mask edges resulting in penumbral blurring or shadowing. These flaws can be straightforwardly eliminated by using a collimated light source, although such sources at the desired short-wavelengths (184-257 nm range) are available. To circumvent the consequences of such light shadowing, we've designed and built a lens system in order to image a pattern, from a chrome mask back-illuminated using the commercial, diffuse UV source. The UV-transparent CaF2 Lens transfers the pattern onto our biomolecular samples. This design allows for clearer patterning and more reliable results. Also, due to the flexibility in positioning the lens relative to the mask, magnification and reduction of pattern size onto the sample can also be achieved. This allows variable sizes without requiring the purchase of multiple chrome masks. Slight limitations do arise because of the distance the sample is placed away from the UV light source. Exposure times have increased greatly, leading to 3-4 hour long exposures. This has been reduced slightly by imaging a greater area of UV light and patterning it onto a smaller sample through reduction. Though not finalized, our new UV imaging system has a strong potential to replace current UV patterning systems for many applications including deliberate blending of nonfocused and focused patterns to further test lipid monolayer spreading. As a CBST intern, I was able to accumulate social, professional, and academic experience as it pertains to graduate school and scientific research. On a social level, I was able to see how the average graduate student was able to balance needs for excitement while still staying motivated about their current scientific research. Instead of the usual 9-5 work day that I had expected, I was able to see how a variable work schedule could work, and in some cases didn’t work. Also, I had a great opportunity to see what graduate students at Davis did. Since I am planning on applying here in the fall, this really gave me a look at how I might be enjoying myself in the coming years. Professionally, I was able to see how graduate students go about working, trying to find funding, and trying to appease PIs and fellow lab researchers. The balance of all this made getting work done somewhat of a challenge, but it seemed to work out for those who were truly motivated. Lastly, through CBST, I had many excellent opportunities to network. This included obvious contacts like the lab group I worked in, lab groups that participated in the CBST retreat, and fellow CBST interns. I appreciate all that CBST has allowed me to do, and I hope to work with them in the years to come. Prediction of relative concentrations of individual components in a biochemical system based on fluorescence spectroscopy is conventionally achieved by applying chemometric methods (i.e. Principal Components Regression (PCR) and Partial Least Squares (PLS)) to the fluorescence spectrum data. Since these methods use only spectral information, their accuracy is questionable when the emission spectra of the individual fluorescence components significantly overlap. Using time-resolved laser-induced fluorescence spectroscopy (TR-LIFS), we can characterize fluorescence both in the spectral and temporal (lifetime) domain. In the context of TR-LIFS, the intrinsic fluorescence decays have to be estimated from the experimental data using deconvolution methods. A novel deconvolution method based on the expansion of the intrinsic fluorescence decay on orthonormal Laguerre functions has been recently introduced. This method estimates a unique set of Laguerre expansion coefficients (LEC) containing both the spectral and lifetime characteristics of the fluorescence signal. Here, we discuss a novel method based on the analysis of LEC for estimating relative concentrations of fluorophores in a biochemical system. In this method, LEC can be obtained from the individual fluorophore and from the mixture of fluorophores. The fluorescence of the mixtures can be described in two ways: by a linear combination of each component whose LEC are known, and by expanding its own intrinsic fluorescence emission based on the same Laguerre basis. By relating both mathematical models of the mixture fluorescence, the relative contributions of each individual component can be estimated. This method was validated in mixtures of two dyes with overlapping emission spectra (Rose Bengal and Rhodamine B), showing better performance than PCR and PLS. This new chemometric technique can be easily expanded for samples containing more than two components and has many potential applications in chemistry, biochemistry and medicine. Being a novice in the field of Biophotonics, initially I spent a lot of time reading literature related to the field and research interests of Dr. Marcu’s lab. Since our lab had recently moved to UC Davis, it was not fully functional for experiments yet. However, once I became more familiar with ongoing activities of the lab, I decided to work in data analysis which mostly involved math and programming. Dr. Marcu, Dr. Hollars, and Dr. Javier Jo were very supportive and always willing to help when I ran into problems. I am very grateful for their patience and support. Apart from the lab, the group of interns was very diverse which made socialization during retreat and seminars more enjoyable. Retreat was a perfect way to experience a science conference for the first time. It gave me a snapshot of academia and I learned that it’s not as boring as it may sound. Although heavily packed with scientific materials, the location of retreat made the experience more joyous. Seminars and workshops covered many aspects of professional skills required for job hunting and academia which I wouldn’t have learned in such a formal manner. For that, I thank Ana and Marco. Since Davis is a small city, going around the city on bike was a novel experience too. Looking back at the whole experience, I can’t think of a better way to spend nine weeks of summer other than living in California, learning about biophotonics, hiking in Tahoe, and making great friends while getting paid for doing all that. Head and Neck Cancer is the sixth most common cancer worldwide. Vitamin D has been shown to induce cellular differentiation and suppress tumor cell growth in Head and Neck Cancer cells in vitro. In the Albala lab, we are interested in investigating the proteins and pathway involved in the DNA damage repair. We are employing a variety of proteomic techniques to characterize this pathway. Our hypothesis is that Vitamin D acts as a radiosensitizer that impairs the DNA damage response in head and neck cancer cells leading to apoptosis. We are examining the effect of combination treatment of Vitamin D and ionizing radiation on multiple damage response proteins. H2AX is a DNA damage response protein. H2AX foci are markers for DNA damage. In a previous experiment, the foci were examined to qualitatively determine the DNA damage response in untreated and Vitamin D treated cells after exposure to ionizing radiation. Vitamin D treated cells show a diminished occurrence of H2AX foci indicating a down-regulation of the DNA damage repair pathway. There are a number of different cell lines of head and neck cancer that develop in the different parts of the head and neck with varying sensitivities to Vitamin D treatment. Therefore, various cell lines will need to be screened to attain a conclusive result. We are also investing RAD51, which is a central protein for DNA double strand break repair. 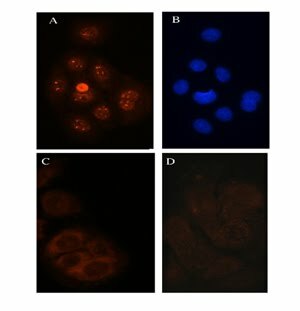 Cell lines deficient in any paralog of RAD51 have demonstrated sensitivity to ionizing radiation and crosslinking reagents indicating a defect in homologous recombinational repair. Western blot analysis has been performed to measure the expression of RAD51 to determine the effect of Vitamin D and ionizing radiation on the DNA double-strand break repair pathway. There is a demonstrated decrease in the expression of Rad51 protein. This suggests that Vitamin D may increase the effect of ionizing radiation by making the cells more sensitive to radiation by decreasing the repair response. Figure 2: Combination of Vitamin D (VD) and ionizing radiation (IR) treatment inhibits RAD51 expression. We aim to verify these observations using protein microarrays with the same samples. Further work needs to be completed to optimize the conditions of the microarray for improved analysis and detection of the spots. We will use two different types of arrays including an antibody array and a reverse array. In an antibody array, individual antibodes are spotted on the slide and lysates are applied. In the reverse array, lysates are spotted on the slides and antibody is then applied. Experiments will also need to be completed to examine the other proteins on the pathway. This was my second year as a CBST summer intern and I have taken a new set of lessons from this experience. As a returning intern, I have developed a new confidence for working in the lab. I worked in the Albala lab for a second summer. Since I had already learned the basic techniques last summer, I was able to handle greater responsibility and run experiments independently. I was also able to learn several new research techniques that I hope to apply to future work in graduate school. My summer experience confirmed my true desire to pursue research as a career. The CBST internship has impacted my life in another way outside of the lab. This summer was my first experience living in an apartment and having to fend for myself for food and all other life necessities. This experience tested my ability to take care of myself living in an apartment with roommates. The internship allowed me to prove to myself and my family that I can survive on my own for the summer and in the future during graduate school. This experience has given me newfound independence and confidence in myself. The other interns in the program were all amazing and intelligent people. Each intern brought their own experiences and outlook to the seminar series. We were all able to learn from each other, which enhanced the experience for all the other interns. I learned so many new and different things during both of my summers participating in this program. I would encourage everyone to apply to this program because of all the great opportunities that it offers students. Alzheimer’s disease (AD) is a neurodegenerative disease characterized by progressive cognitive deterioration and specific pathological changes in the brain. In addition, the brains of Alzheimer’s patients typically exhibit increased inflammatory activity, including increased cytokine expression and activated astrocytes. Past research in our lab has indicated that the lipolysis products of triglyceride-rich lipoproteins (TGRL) and lipoprotein lipase (LpL) are associated with endothelial injury and increased inflammatory activity. The aim of this project was to investigate the effects of TGRL lipolysis products on the inflammatory cytokine expression of astrocytes. Human astrocytes, which comprise part of the blood-brain barrier, were treated with media alone, TGRL + LpL (250mg/dL + 3 units/mL), LpL alone (3 units/mL), TNFα (20ng/mL), or IL-1β (10ng/mL) for 2-4 hours. The expression of inflammatory cytokines IL-1β and MCP-1 was then determined by quantitative real-time PCR. In both cases, the cytokine expression most dramatically increased after treatment with lipolysis products for 4 hours. IL-1β expression after 4 hours increased 7-fold compared to the media control, whereas MCP-1 expression after 4 hours increased 170-fold. These results suggest the potential relationship between the inflammation associated with consumption of a moderately high-fat meal and the inflammatory activity present in AD. Although this is my second summer with the CBST summer intern program, I feel that I have again gained invaluable research experience in and out of the laboratory. During the weekly seminars, I learned helpful techniques about writing, interviewing, and networking within the scientific community. Also as a result of the seminars, I finally decided to pursue my Ph.D. due to a tremendous panel of speakers that relayed their experiences in graduate school and in their careers. During the Tahoe retreat, I was further exposed to knowledgeable scientists, post docs, and physicians that worked in a variety of exciting disciplines. Above all, my research within the lab has been the most rewarding. I have learned many new techniques and skills that I will surely carry with me though the rest of my career. I am also proud to say that I was able to design and carry out a project related to Alzheimer’s disease, and I believe that this exciting research will be a good starting point for my future career in medical research. Head and Neck Cancer is the sixth most common in the world, and the current treatments for it involve invasive surgery and/or chemotherapy and do not result in a very high survival rate. Certain retinoids, however, such as Vitamin A and D have been shown to suppress cell proliferation and promote apoptosis in head and neck squamous cell carcinoma (HNSCC), the most common form of head and neck cancer. Our goal is to find the mechanism by which Vitamin D acts on HNSCC cells. The epidermal growth factor receptor (EGFR) signaling pathway is a possible candidate since it has been shown that EGFR expression, which normally leads to cell proliferation and growth, is reduced upon treatment with Vitamin D, leading to apoptosis. We hypothesize that AKT and ERK ½, downstream proteins in the EGFR signaling pathway, are also suppressed by Vitamin D. Primarily using the BioPlexTM 200 technology, we have been able to study the expression of the phosphorylated forms of EGFR, AKT and ERK ½ in the cell line SCC 25, and compare that to the activity of the whole proteins. Our data suggests that the levels of the phosphorylated forms of AKT and ERK ½ may be only slightly affected by Vitamin D and that EGFR suppression may lead to apoptosis via a few or several other mechanisms. I used single molecule fluorescence and fluorescence lifetime measurements of fluorescent dyes conjugated to DNA to better understand the photophysical and photochemical interactions between organic dye molecules and DNA. This process is important, because fluorescent dyes are frequently used as labels for DNA, but interactions with specific DNA bases can significantly affect the fluorescent properties of the dyes, leading from chromatic shifts all the way to fluorescence quenching. Thus, it is very important to obtain a full understanding of the photophysics of these interactions if cDNA or siRNAs are used as molecular probes. I studied DNA hairpins that were labeled with different numbers of red-emitting Atto655 dyes. I investigated three different samples: a DNA hairpin labeled with three dyes, one with two dyes, and one with only one dye attached to specific bases and well-known spatial separations. Sample preparation consisted of denaturing and annealing the short synthesized single strands of DNA into the hairpin structure, diluting the solution to 10-10 M concentration, and adhering the sample to a cover slip using poly-l-lysine solution. I used the Picoquant Microtime 200 Scanning Fluorescence Confocal Microscope to collect lifetime data. Single molecule fluorescence lifetime is the average time the molecule spends in the excited state over multiple excitations. The data revealed that the different hairpin samples had different excited state lifetimes, which indicated interactions between the dyes, potentially due to dye-dye coupling (energy-transfer), interactions with the DNA, or with specific DNA bases adjacent to the dyes. The single dye samples had an average lifetime of 3.5 ns, the samples with two dyes had an average lifetime of 2.9 ns, and the ones with three dyes had an average lifetime of 3.2 ns, when integrating lifetime data over several molecules. Future work will be done to determine if the lifetime differences are due to the distance between dyes or dye-DNA interaction. Histograms of fluorescence lifetime data for many tens of DNA-dye complexes will be obtained and analyzed for their different contributions. Being an intern through the CBST Summer Internship Program was a great experience. I saw what working in research was like, was exposed to the range of research conducted by CBST during the retreat, learned a few things from the weekly seminars for interns, and met some wonderful people. Working in Dr. Thomas Huser’s lab was my first lab research experience and my first paid job. Having a 9 to 5 job was quite different from my volunteering stints. As a Microbiology major, I had hoped to work on a biology-related project. Instead, I found myself involved in a physics-centric lab, dealing with lasers, fluorescence, and Raman spectroscopy. Dr. Huser suggested that I study single molecule fluorescence, a topic I found interesting despite the fact that it dealt more with physics than biology. Once I started collecting data with the Picoquant Microtime 200 Scanning Fluorescence Confocal Microscope, I felt that I better understood what was going on. The true test of my understanding came when I had to put together my powerpoint presentation. I finally learned the reasoning behind everything I was doing. My secondary mentor, Dr. Samantha Fore, helped me out so much this summer. Dr. Huser was often busy, but always took some time to help the interns who required assistance. Working in a physics lab was different from what I had expected, but I enjoyed my experience nonetheless. As a UCD student, I will be able to continue working on my project into the school year. Susan Spiller, Ph.D. & Clark Lagarias, Ph.D.
Phytochromes are photoreceptors that sense changes in light conditions and adapt via photomorphogenesis. These biliproteins convert between inactive and active forms in response to different wavelengths. They covalently bind a linear tetrapyrrole chromophore derived from heme. The chromophore-binding GAF domain and the related PHY are the characteristics for phytochromes. Until recently, phytochromes were thought to be restricted to photosynthetic eukaryotes; however, genome sequencing and mutant analysis have uncovered genes similar to plant phytochromes in cyanobacteria and other prokaryotes. Five phytochrome-like proteins, or Phr, that showed homology to plant Phytochromes were isolated from Thermosynechococcus elongatus BP-1, a unicellular, rod-shaped cyanobacterium isolated from a hot spring in Beppu, Japan. Among the five, the protein for tlr0911 is the largest. The goal of this project is to co-express tlr0911 with plant and cyanobacterial chromophores and characterize them. tlr0911 was cloned into the pBAD-MycHisB vector. The vector construct was then transformed into a LMG194 E. coli strain containing a plasmid that coded for enzymes that synthesize the following chromophores from native E. coli heme: phycocyanobilin (PCB), phytochromobilin (PhiB), and biliverdin IXα (BV). Co-expression of tlr0911 and each chromophore were induced using L-arabinose and IPTG. Cells were then lysed using French press. Protein purification was done using BD TalonSpin . We studied expressed protein via absorption spectrophotometry and SDS-PAGE gels. The preliminary result shows that Trl0911 has some phytochrome-like spectral patterns. The olive green color of the expressed protein also supports this finding. Currently, a better protein purification method is being investigated. Under this method, the Tlr0911 protein is fused to a self-cleavable intein tag in which a chitin-binding domain allows affinity purification of the fused protein on a chitin column. Additional analysis such as Zinc-bloc and HPLC-mass spectrophotometry will be performed on the purified protein. newly learned networking skills from the seminar; I learned kayaking; At the science section of the Retreat and the follow-up Q&A sessions, I was introduced to many cutting-edge Biophotonics research areas and techniques. The talk on stem cell research was especially eye-opening. Overall, I truly cherish this CBST internship experience and I have many thanks to Ana, Marco and the other CBST staff who have been very supportive through out the summer. unified spectrum analysis package that allows us to differentiate cells based on peak intensities. had I understood everything. The seminars were as a whole very informative, but I felt like some of them were less useful to me than others. However I realize that my background may have exposed me to these particular topics and many of the interns do not have such a background. I throughly enjoyed living in Davis and meeting an entirely new group of people. I probably most enjoyed being able to commute by bicycle every day. Phytochromes are red/far-red light sensory photoreceptors that control many aspects of plant response to light. Phytochromes undergo reversible photoconversion between inactive Pr and active Pfr forms upon exposure with red and far-red light, respectively. Pfr phytochromes translocate from the cytoplasm into the nucleus whereupon they activate signaling cascade by inducing change of gene expression. The cytoplasmic signaling output of phytochrome is presently unknown. Research in the Lagarias laboratory previously discovered that Y276H mutation in phytochrome B (BYH) locks the photoreceptor into a Pfr-like conformation that is constitutively active and localized in the nucleus in a light-independent manner. The present work was undertaken to test the hypothesis that introduction of the D1040V loss-of-function mutation into a BYH construct will suppress the gain-of-function of the Y276H mutation. Using site-directed mutagenesis, I have introduced both Y276H and D1040V mutations in a PHYB gene and introduced this mutant gene into the phyB-5 null mutant by Agrobacterium-mediated in planta transformation. I am in the process of identifying T1 transgenic plant lines by antibiotic selection and by phenotypic analysis. The phenotype of T2 transgenic lines will be compared with the phyB-5 mutant parent and with wild-type plant lines. Results obtained from this study will provide insights regarding phytochrome B's function in the cytoplasm. 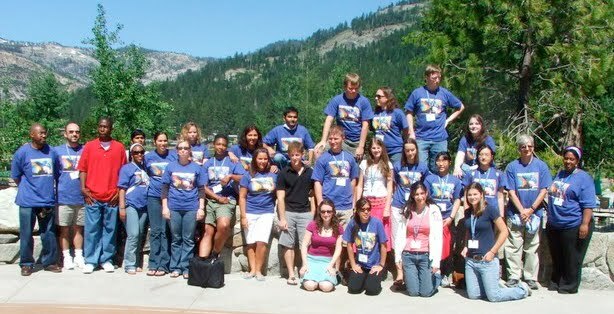 The CBST summer internship provided valuable professional and personal experiences in a scientific community. From working with Ph.D.s and grad students in the lab to getting to know my fellow interns, I was exposed to a broad spectrum of situations that were both educational and fun. Working in the lab gave me an idea of what is in store should I go on to grad school and choose research as a career. I also gained technical skills that can only be acquired through experience. Seminars and activities provided a basic knowledge of networking and writing that cannot be learned in the lab but are crucial to anyone in a professional scientific community. The retreat and trip to Muir Woods were really great opportunities to form friendships with students from all across the county. As a UC Davis student it was great to be able to work on campus and keep living in town, and I’m happy to say that I will continue to work in my lab during the school year. The CBST summer program is much more than just a summer job in a lab. It is a foundation on which to begin building a successful career in the sciences. Vitamin D and its active metabolite calcitriol (D3) have been shown to be very effective in androgen-dependent prostate cancer; however, its effectiveness has been limited by its toxicity at concentrations that will reduce the size of the tumor. Therefore, synthetic analogues of vitamin D3 have been developed which are less toxic. One such synthetic analogue,1α-hydroxyvitamin D5, has been shown to reduce cell proliferation and increase apoptosis and cell differentiation in various cancer cells similarly to Vitamin D3, at a concentration of 1 log higher than D3, without increasing serum calcium to toxic levels. Previous results from our laboratory showed that vitamin D5 at 1 μM and D3 at 100 nM were effective in inhibiting the growth of an androgen-dependent cell line LNCaP, but the effect of this drug in androgen independent cells had not been tested. The current study compares the effects of D3 to the effects of D5 on cell proliferation and expression of PSA in two androgen independent prostate cancer (AIPC) sublines LNCaP-AI and C4-2, derived from the androgen dependent cell line LNCaP. Relative cell proliferation was assessed by MTT assay and relative expression of AR and PSA were assessed by western blotting. D5 at 1μM was as effective as D3 at 100nM in inhibiting the growth of LNCaP-AI cells, but both drugs were ineffective in C4-2 cells. However, the expression of PSA increased dramatically when exposed to 100nM D3 in C4-2 cells, but did not increase when exposed to 1μM D5. This effect was not tested in LNCaP-AI cells which did not express PSA. These results suggest that vitamin D5 would be an effective treatment for recurrent prostate cancer. The Center for Biophotonics Science and Technology summer internship program helped me to achieve my research goals as an undergraduate in biology and biochemistry. I gained experience working in a cancer research lab, where for the first time I was expected to generate data that could be used to publish a paper. I also had the opportunity to work with people who really love what they do, who go to work every day with purpose and focus. These two things in combination really motivated me to work hard to become a better researcher and a better scientist. Additionally, through our weekly meetings and discussions with some of the other interns, I got some good advice about how to choose a graduate program. I am deciding between an M.D./Ph.D. and a Ph.D. program and my fellow interns have suggested doing a mini-peace corp. or volunteering at a local clinic. Overall, I feel this internship showed me what it takes to really do research for a living. It allowed me to be sure that this is something I could spend my life doing. Ubc9 is a conjugating enzyme responsible for sumoylation of intracellular proteins. In this study, we use one-bead-one-compound (OBOC) combinatorial library method to discover peptides and small molecules that bind to Ubc9. These molecules may inhibit Ubc9 enzyme activity, and therefore can be used to study the effects of sumoylation inhibition on cancer cell function, transformation, invasion, and growth. After screening an OBOC combinatorial peptide library, 26 peptide-beads were identified. These peptides were re-synthesized on Tentagel beads and used for binding test. Anti-Ubc9 IgG and alkaline phosphatase (AP) conjugated goat anti-rabbit IgG were used as secondary reagents to detect the binding of Ubc9 to the peptide on the surface of the bead. AP converts its substrate 5-bromo, 4-chloro, 3-indoylphosphate (BCIP) to blue precipitates that stay on the beads. Preliminary experiment indicates that there were no difference in the bead staining whether Ubc9 is present or not. These results could be due to the fact that too much antibodies were used. We need to repeat the experiment with lower concentration of antibodies. As an intern I really enjoyed my summer with CBST in every aspect. The seminars that we had every week were really helpful because they prepared us for the next step in the program. The best part about the internship was getting to interact with the other interns on a regular basis. I have met some of the most wonderful and people that I will probably ever meet in my entire life while participating in this program. The extracurricular activities that were planned for us interns were a great tool for us to get to know each other on a personal level. The retreat in Tahoe was one of the most amazing events that I have ever been a part of. The retreat allowed us to meet and interact with everyone who is involved with CBST. This was my first internship and I barley knew that basics but the knowledge that I gained from working in the lab will stay with me forever and I really value this experience because I have learned so much I n such a short time and I will always remember my summer with CBST. Human Kallikrein-7 (KLK-7) is a serine protease of the chymotrypsin family and it becomes over-expressed in patients with breast cancer and dermatitis. As of yet, there is no known peptide/small molecule substrate commercially available for this enzyme. Highly specific and efficient peptide substrates will allow scientists to monitor the enzyme activity, which can be used as a biomarker for disease progression. We propose to identify the best substrate for KLK-7 by screening OBOC (one bead one compound) fluorescence resonance energy transfer (FRET) combinatorial libraries. Recombinant KLK-7 was used in our study. KLK-7 can be activated by thermolysin, which can subsequently be inactivated by adding 50 mM EDTA. About 75,000 peptide-beads were incubated in KLK-7 (10 µL/mL) in 50 mM Tris buffer (pH 8.5). The beads were monitored under a fluorescent microscope (excitation and emission were at 460 nm and 410 nm, respectively). When the protease finds a substrate, it cleaves and removes the quencher, making the bead fluoresce. Twenty-five fluorescent beads were identified, physically isolated and submitted for micro-sequencing. We are in the process of characterizing these peptide substrates. It’s different living on your own, but we get used to it. In fact, I’m so happy I was able to plunge into my first internship and live on my own and support myself because it helped me become more independent. I know I grew as a person this summer, as a student and a researcher, but I must say, it wasn’t an easy thing to do at first. There’s always that pressure of not making a mistake. But in the lab, no matter how hard you try, you can never get it to work the way you want. I think that’s a really important lesson for students, not only in research, but in life. Things don’t always go the way we expect and this internship helped me accept that. Sometimes work was overwhelming, like trying to do a presentation, an abstract and a personal review in one week but I was able to learn in and out of the lab, through the seminars, the retreat and, of course, the research. With all the seminars, the retreat and all the activities, there was never a dull moment. The activities were especially important to me, mostly at the beginning. I must say the best activity was Tahoe, but even so, they were all fun. The activities offered the chance to get to know everyone and really bond. I met incredible people this summer and I hope we all keep in touch. They all have made an impression on me and I will never forget this summer. I can never thank enough the people who made this possible. We are studying a method to detect proton transport across a lipid bilayer. This is important because understanding and detecting transport across a bilayer can provide important insight into the membrane permeability – an important criterian for its role as a transport barrier in living cells. Our hypothesis was that a bilayer suspended over a colloidal crystal will prevent proton transport in the absence of ion channels. A drop of lipid vesicles (doped with Texas-Red, TR) is placed on a Petri dish, and a planar hydrophobic colloidal crystal (OTS-derivatized) was placed on top. The vesicles then fused for an hour, and then were rinsed in deionized (Millipore) water (pH 7). Subsequently, a buffer of pH 10 was added and the slide sat on microscope for 10 minutes. The slide was then viewed and pictures were taken in three different image settings: TR, FRET, and FITC. After ten minutes TR and FRET became duller, while FITC turn out to be brighter. With the data we retrieved, we see that in the FITC setting there is a positive correlation at a higher pH, in TR there is a negative correlation, and in FRET we observed a negative correlation because it is infleuenced by TR. A central, unexpected, finding of this study was that diminution in TR, rather than FITC enhancement, is a better probe of proton permeation, such as when pH is changed. At present, we do not fully understand the chemical basis of this observation. Further work will be done in the future with the effects of TR on FRET, because the date is a clear indication that TR is more influential than FITC. I am so grateful I had an opportunity to take part in this research program. Because of this internship I have experienced tremendous professional growth. Coming in, I had so many questions and concerns about what I wanted to do with my career, and I can honestly say that through seminars and talking with various experts in the medical/research fields, that these issues were thoroughly addressed. My mentors helped me focus on the career path I really wanted to follow. I now realize that I have a strong desire to pursue research and medicine. Leaving the internship, I have a far greater understanding about all the exciting areas I can go into. In particular, I would like to expand on the research I did in the lab, which includes lipids, bilayers, and colloids. A method for maskless modification of lipid bi-layers has recently been developed using femtosecond laser pulses. These pulses are tightly focused through a microscope objective creating a void in the bi-layer at the focus. An interactive LabView program was written in conjunction with a Matlab script which allowed for automated sample manipulation based on user defined parameters. This software has greatly improved the capabilities of this technique by allowing for well defined, reproducible, and regular patterning of the lipid bi-layer on the nanometer scale. My Experience as a CBST Summer Intern was wonderful. Not only did I gain valuable research experience and improve my skill set by spending much of my time programming in LabView but I also benefited socially and professionally. Socially, my interaction with the other interns at the retreat, Muir woods trip, and at the weekly seminars made the summer fantastic. Professionally, the contacts I made at the retreat and advice I received from those with an established career in Biophotonics was invaluable in helping me solidify my goals and the direction I will take as a graduate student. I was not involved in any particular research project, but was here as a technical student to observe and learn about the equipment used in the research being done at the Center. I attended a laser trapping seminar and was involved in several technically challenging projects, most notably, getting a pair of old argon ion lasers to work, and transmitting laser light via fiber optics into various devices for biological imaging. The lasers, both built in 1989, had been in storage for some time and their conditions were not fully known. One of them, a Coherent Innova 200 was missing some important parts. The other, a Spectra-Physics Model 2040 appeared to be complete. We obtained all of the hoses, fittings, and filters required to connect the lasers’ cooling systems to the building’s process water system. We obtained a key for the Innova, borrowed a controller for it from a similar system, and connected the water and power. We switched it on and quickly got it to work, even though faults were indicated. The laser eventually failed, possibly as a result of overheating caused by a “low water flow” condition. The Spectra-Physics laser leaked water from several locations. We replaced a leaking flow sensor and requested a service quotation for replacing the seals in the power unit. Unfortunately, we could not test this laser. We used fiber optics to route light from a new Coherent Innova 70C Argon/Krypton Ion laser to an adjacent laboratory to be used in fluorescence imaging experiments. I am engaged in the greatest adventure of my life: changing careers in middle age. I felt somewhat out of place because I am much older than everyone else, am a vocational-technical student, and was not involved in any particular research. Nevertheless, I worked with some brilliant, interesting, and inspiring people. I worked on interesting projects in support of the actual research being conducted by graduate students and post-docs. I did things I would not have been able to do elsewhere. I was able to see the mind-boggling assortment of lasers and other equipment used in research. I felt overwhelmed by the science at the retreat, but the poster presentations showed me some interesting, practical things that I’d like to learn more about and may attempt to pursue in my career. I found the seminars to be useful, but did not understand the point of the “Challenging Stereotypes Workshop”. The “Career Opportunities in Biophotonics” seminar was disappointing because it only seemed to apply to people who wanted to earn a PhD. I rented a bedroom in a home in the North Natomas area of Sacramento. I found it by placing an ad at the website of the local newspaper and it worked out as well as could be expected. I enjoyed meeting the other interns, graduate students, and researchers. The trip to Muir Woods and Beach allowed me to see the Pacific Ocean and the redwood trees, and was probably the only chance I’ll ever get to do those things. Many of the genetic diseases that we as humans suffer from are the result of defects in the nucleotide excision repair pathway. This system is what enables abnormalities and lesions in our DNA to be removed and replaced with the correct sequences. Several aspects of this repair process are currently unknown, and without further understanding of this process the treatment of patients with DNA defects will remain difficult. Optical methods are now being used to learn more about the DNA repair pathway, including a method called Fluorescence Correlation Spectroscopy, or FCS. FCS uses laser excitation combined with a confocal lens setup to reduce the sample excitation volume. This allows for the study of molecular interactions at low volumes and the detection of particles at the single molecule level. In FCS, the raw data is collected as a photoelectron stream and correlated in a pairwise fashion. Due to the specific coding as well as the software used to create the program, the existing operating version’s correlation computation program ran quickly for large time increments, but drastically slowed down as time increments became smaller. The increase in waiting time became so great in some instances that the program was deemed unusable. The goal of my work was to modify the current program (by switching languages and altering the code of past authors) to output data faster. I was ultimately successful in producing a faster-running program and am currently in the process of formatting the program so that outputted data can be more easily implemented and used by future users. I liked the fact that we were able to find our own places to stay, giving us some degree of control over our living conditions, whether to have roommates or not, etc. I was also grateful for the support of the staff and the ease with which I was able to converse with them, specifically Ana, Marco, and Erica. I enjoyed the weekly seminars and the social activities planned by Ana as well. I was pleasantly surprised by the availability and helpfulness of my PI as well as the graduate students in my lab. The atmosphere was refreshing and something I hope to find in my search for a graduate program this fall. - Insight into the life of a graduate student, from daily lab activities and interacting with fellow students, to presenting work for the critique of faculty. - Another opportunity to sharpen my presentation skills. - Access to a network of bright fellow students most of which are also pursing graduate study in the sciences. - A chance to learn about exciting ongoing research in biophotonics. - Time to pick the brain of professors and scientists on topics of personal interest, including the contrasts of industry and academia as well as various graduate fields and their relation to computational modeling. I would recommend this program to any one with a curiosity for biophotonics as well as those eager for a challenging yet abundantly rewarding research experience!